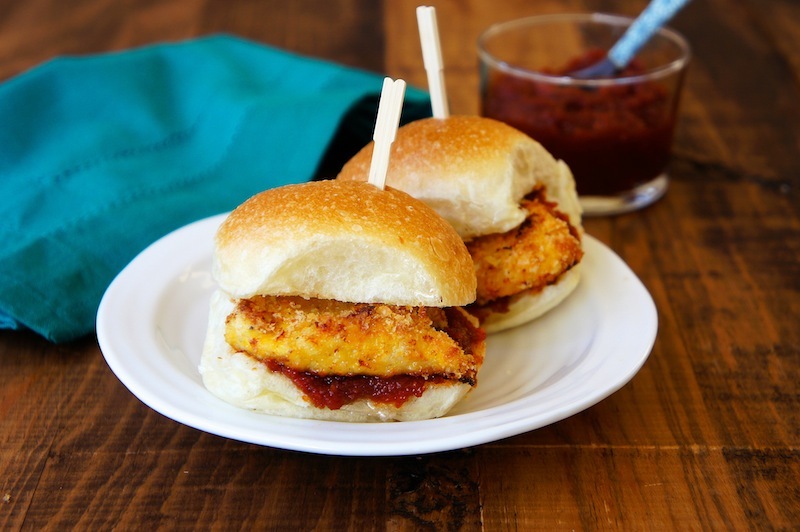 Try this Easy Chicken Sliders with Spicy Tomato Sauce, or, with your favorite dressing. Preheat the oven to 375˚F. Line a large baking pan with tin foil. Season the chicken cubes with sea salt, and black pepper. 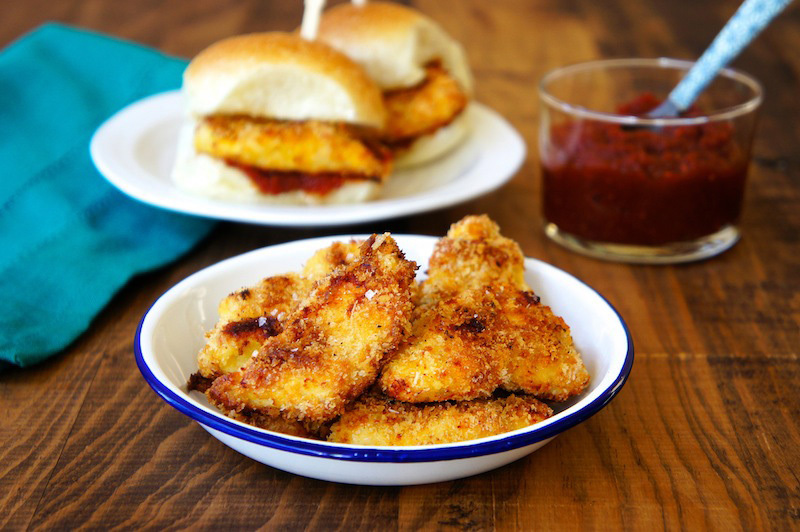 Toss the seasoned chicken cubes with the flour, then into the beaten eggs and coat with Panko breadcrumbs making sure that all the nooks and crannies are covered. Arrange coated chicken cubes in a single layer. Drizzle a little oil on top of the chicken and bake for about 25 to 30 minutes. To serve, spread some spicy tomato sauce on the buns, and place the baked chicken on the bun. Serve immediately. These do sound and look marvelous. The amount of baking time seems a little excessive?!? Oops! The total baking time should be around 25 minutes. Thanks for pointed it out. Theese sound sooo good. And they are healthier, too, then the deep fried version. I made something similar a while ago but I also mixed some parmesan in the breading. Me encanta tu receta, con tu permiso me la guardo. Un saludo desde mi cocina. I will definitively try these, there's nothing better than some homemade fast food after a long day of work ! Hi there. The current Food on Friday on Carole's Chatter is about burgers. I do hope you link this lovely one in. This is the link . Please do pop back to check out some of the other links – there are a lot of good ones already. Have a great week.